Speaking not only as a Life Coach, BPD, and mental Health Coach, A.J. Mahari emphasizes to you, if you are adult child of a parent with BPD, NPD, or any personality disorder (or combination of said) and/or whose parent(s) were alcoholics that you need your own recovery. Children do learn what they live. A tremendous amount of the inter-generational suffering of those who were the children of a personality disordered parent or parents has to do with the toxic legacy of not resolving issues such as codependence, enmeshment, toxic relating, chaotic and unhealthy relationships, with one’s parent(s). Most people who are an adult-child of a borderline parent have low self-esteem and/or low-self worth. This is a result of the incongruence of the borderline parent and the splitting – perhaps idealizing to some extent or trying to support you and then the pulling away of that support or any positive thoughts or feelings about or toward you and the devaluation and criticism that goes with that very painful experience. 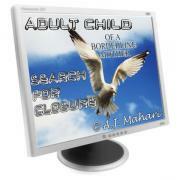 There is a legacy to having been the child of a personality disordered parent or parents and A.J. Mahari knows this all-too-well in her own personal life as well having had a mother with BPD and a father with BPD/NPD. Personality Disordered parents are not emotionally available and children are negatively impacted as a result. 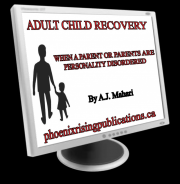 Adult children of a personality disordered parent or parents need their own recovery. Many an adult child who growing up had a mother or father with Borderline Personality Disorder and/or Narcissistic Personality Disorder separately or co-morbid and perhaps even co-morbid with other mental health challenges and/or other personality disorders need to recognize that they have been psychologically wounded. Wounded in ways that perpetuate suffering in other relationships, suffering inside, alone, often reeling from unresolved abandonment, invalidation, and grief. This applies to all adult children whether you yourself have also been diagnosed with a personality disorder or not. Many can and will benefit from my Life Coaching Services to sort out what you need to do, how you can heal and leave the past behind and move forward in your life. I have been there in my own personal life and I know what it takes to find your freedom from the soul-crushing and painful chaos of the toxic relating with a personality-disordered parent. Until you resolve these issues and find your closure, something I work on with many adult children of a personality parent or personality disordered parents, you may well feel anxious or depressed, not trust your instincts and judgment, not know who you really are, be repeating a toxic pattern of unhealthy relationships. You can free yourself from all of this. You can find your own happiness. You can heal the codependent enmeshment and over-come toxic guilt. You have a right to make your own choices and to empower yourself in the here-and-now. © A.J. Mahari, February 14, 2011 – All rights reserved.